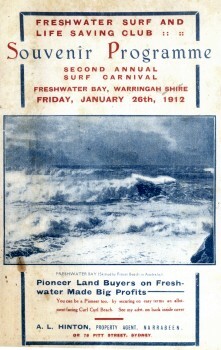 Freshwater SLSC : Carnival Programme, 26 January 1912. The program for the second Freshwater Carnival demonstrates the club saw the event as a significant occasion on which to raise funds with an attempt to appeal to the general public by providing a combination of entertainment and competition. Apart from the initial Fancy Dress Parade from the Manly Wharf to Freshwater Beach, note the inclusion of the events described as Treacly Apple Race, Carry a Chum Race, Obstacle Race, Cockfighting, Pillow Fighting, Climbing the Greasy Pole. The Carnival Officers include responsibility for Barriers, Gates and Ticket Sellers (page 3). Significant funds were forthcoming from advertising (at £1-1-0 a full page) in the 3000 freely distributed copies of the souvenir program as detailed in a letter from Wm. R. Waddington, Hon. Sec. included in advertising material on page 12. Event Number 6, the surfboat display, was no doubt by the Sly Brothers in their boat, mostly beached at Shelly or Fairy Bower Beach, from Manly. Event Number 10, the "exhibition by Mr. Fred Nottingham (sic) in the 'Big Risk' Surf Canoe" (page 5, the name has been correctly adjusted on page 19) reprised a similar exhibition the previous summer by Fred Notting at the fourth carnival of the Manly Surf Club on Saturday, 1 April 1911. - Daily Telegraph 3 April 1911, Manly Surf Carnival programme 1911. -noted by S&G Champion: Drowning, Bathing and Life Saving (2000) page 144. The experimentation with a variety of canoe and boat designs by Australian surfriders was no doubt instrumental in the ready acceptance of the Harry McLaren's surf ski, introduced to Manly by J.S. Crakanthorp in the early 1930s. "A clever exhibition of surf board shooting was given by Mr. Walker, of the Manly Seagulls Surf Club. With his Hawaiian surf board he drew much applause for his clever feats, coming in on the breaker standing balanced on his feet or his head." - The Daily Telegraph 27 January 1912, page 21. Tommy Walker's attendance at the carnival is noted as a competitor representing Manly Sea Gulls Life Saving Club in the beach sports listed on page 31. JUDGES-WATER EVENTS: Messrs. S. Fullwood, H. Rathborne, W. A. Kellam. JUDGES-BEACH SPORTS: Messrs. W. C. Fisher, R. O'Brien. W. H. Walker. TIMEKEEPERS: Messrs. L. Abel, F. Williams, C. Martin. CHECKSTATER: Mr. M. E. Fitzgerald. w. J. Henderson. A. F. B. Hull. E. W. Brierly. J. Byrnes, J. Hinton. PRESS AND RESULT: D. D. McIntyre. CALL: E. W. Munro, K. V. Holmes. G. Drury. CAP AND COSTUME: J. B. Steel, J. B. Pym. C. L. Westcott. PROPERTIES; W. J. Owen. R. N. Beale, G. Dobell. REFRESHMENTS: J. C. Bowrey, S. Dobell, G. O. Young. POLICE AND BAND: R. Mills. BARRIERS: J. Gourlay, F. Paddon, G. Wright, G. Millar. F. Ridgeway, C. J. Wilson. TICKET SELLERS: M. P. Richards. J. Bulte, H. Corbett. A. Maul. GATES: J. C. Bowrey. A. H. McNamara, R. Sobels. HON. TREAS. : S. F. Gall. HON. SEC. : R. Waddington. ASST. HON. SEC. : D. D. McIntyre. EVENT NO. 1.- FANCY DRESS PARADE. Gomic (sic, Comic) 10/6 for best sustained, and £1 for best group. and (sic) marching. Prize-Life Saving Belt, valued at 17s. 6d. 3 Manly Life Saving Club. Advertising material with photograph of S. G. Baker's Premier Butchery at the top (not reproduced). "Where Quality counts before Price." Freshwater Surf and Life Saving Club. We hold our 2nd Annual Surf Carinval on 26th inst- for which we are preparing an elaborate illustrated programme- proposed issue 3000 copies whic (sic, which) will be given away (not sold) thus ensuring a better advertising medium. As you have always been a generous supporter of our movement, may I crave your assistance for this Carnival, by a full page advt. in our Programme - prIce £1-1- 0 ? I note that you were good enough to advertise in last week's North Steyne Programme and I shall be glad if you will repeat same advt. in ours. Wm. R. WADDINGTON, Hon. Sec. - The Reply The Hon Secretary, 44, the Corso. Your appeal is strong enough to melt the hearts of even good Mayor Bonnor's (sic, Bonner) stone images which adorn the Corso. For lack of opportunity, I do not do much surfing myself, being mostly engaged in the more prosaic occupation of selling good meat, but my sympathies are- as they should be- entirely with the pastime that has made Manly and district what it is and what in (sic, it) will be. ing Pillow Fighting, Climbing the Greasy Pole. Sea Gulls - T. Walker and P. McMahon. C. Hutchin and A. Roberts. In 1912, the Daily Telegraph reported on the second Freshwater Life Saving Carnival held on the 26 January. standing balanced on his feet or his head." Geoff Cater (2008) : Freshwater SLSC : Carnival Programme, 1912.